A very nice game without the queen. Black made two mistakes at step 9 and 17. First the queens exchange was to early and second the attack with the tower was to weak, because the other stones were missing. 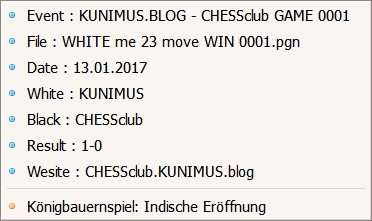 The is the end of my chess variant. On bottom you can send me your variant at step 17. Important! This content was embed from KUNIMUS – YouTube channel. It is an external website. Your choice to WIN with the BLACK stones! 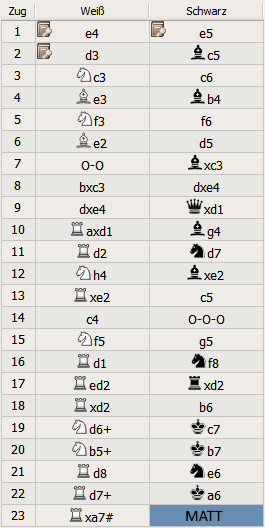 Set the white computer player level to 1700 ELO as an average simulation and win with the black stones. Please play this game from the 17th step as a black player, without the move by tower (xd2) and send me your chess variant about the comment function (see below). 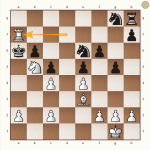 Please use the chess language, or copy the content of you PGN file into the comment field. Look FAQ to helping you to have a RSS Reader. DESIGNER, WEB DEVELOPER, IMPLEMENTATION AND RESPONSIBILITY FOR CONTENTS and LYRICS. 1999 - 2019, Copyright © KUNIMUS ®, also known as Mario Baehnisch. All rights reserved. ♪♫ Music is the melody of life. PHOTO IN HEADER: Pluie d'or by Ronan Follic photographies (www.ronanfollic.fr). KUNIMUS.BLOG benutzt Cookies. Durch Deinen Besuch stimmst Du dem zu.